It was my first time stepping inside the all-new Paradigm Mall, feeling rather disoriented. Direct from the basement parking, I headed for Paradise Dynasty on level 1 to have a nice lunch. Paradise Dynasty is this nice chinese restaurant offering a selection of northern and southern Chinese cuisine, including their famous 8 uniquely flavoured Xiao Long Baos. Level One, Paradigm Mall, Kelana Jaya. 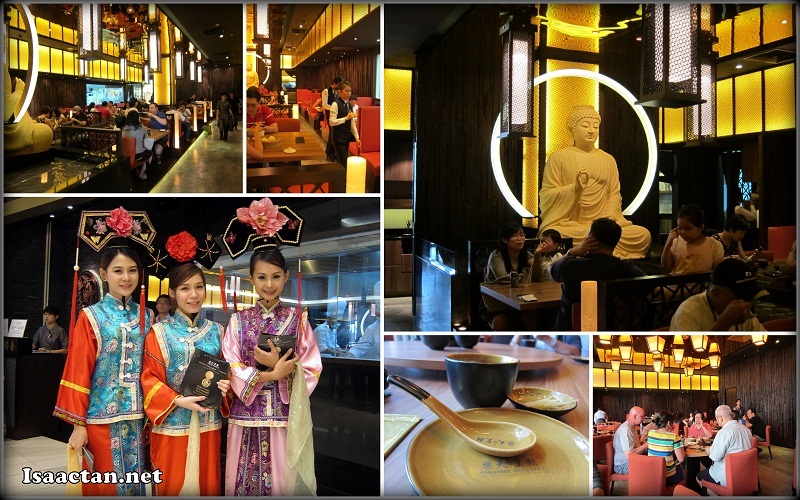 Paradise Dynasty just opened its doors to public not long ago, hence there were quite a number of promotions and even those cute ladies wearing traditional chinese costumes promoting Paradise Dynasty's xiao long baos. We were ushered into our comfortable seats that afternoon to start dining. Paradise Dynasty is part of Paradise Group Holdings which owned a number of other eateries so we were certain the quality here was not going to disappoint. The Xiao Long Baos served by Paradise Dynasty Paradigm Mall was indeed unique in a sense we had up to 8 different flavours to try from ranging from the normal original fresh pork in broth flavour to the special black truffle flavour. Check below on the different types of flavours as shared on malaysianfoodie.com. 2. Ginseng/green – herbal and ginseng flavoured. The xiao long baos in Paradise Dynasty was only the beginning, as we were served with a wide variety of chinese cuisine throughout the afternoon. Check some of the dishes we had that wonderful afternoon. Served as an appetizer to whet our appetite, the chilled assorted eggs loaf in yang zhou style was made up of three different types of eggs (normal eggs, salted eggs, and century eggs). The taste itself was good, I couldn't get enough of these eggs. The second appetizer was their Marinated Jelly Fish with Vinaigrette. Served cold, the texture itself was pretty springy, and had a slight sweet taste to it. If you're a jelly fish lover, then this would be right up your alley. Personally I'm not a big fan of cold dishes, but it has become one of the chinese cuisine specials for restaurants to serve cold drunken chicken dishes with wine. It was a cold dish, one which I could not take a lot of, but one or two piece would suffice to enjoy its flavour. For RM26.80, you can enjoy 6 pieces of these sinfully delicious Braised Pork Belly. Braised perfectly with pork belly made up of three layers of fats and meat, the taste itself was exquisite. I really liked these type of dishes, even though for health's sake, I try not to over indulge in it. The taste itself was nice, with the fats and meat blending well together to give out a really meaty taste. The Sautéed Shredded Pork served with Chinese Flour Crepe was a complete dish in itself. Taken with the chinese flour crepe, wrapping it with the sweet and tasty sauteed shredded pork, I found this dish pretty good. The sauce used here had a tinge of black soy sauce, with oyster sauce and some ginger. Do take it with the flour crepe, as having the pork alone is rather salty. When this dish arrived, I actually thought it was broth but the Scrambled Egg White with Fish and Dried Scallop like its name was made up of scrambled egg white. The whole dish itself felt luxuriously delicious. With broth like texture, the fish and dried scallop blended well inside to further enhance the taste. After all that food, the Deep-fried Diced Chicken in Szechuan Style came in to fire up our tastebuds with load of spiciness. The chicken itself was really crispy, but the chilli included inside was daunting to say the least. If you are not tolerant to spicy dishes, my advice to you would be to stay away from this dish. If you love chillis, then by all means, this dish is made just for you! It was noodles all the way after the initial dishes as we kicked off the first la mien noodles dish with the La Mian in Signature Pork Bone Soup served with Pan-fried Chicken Chop. The soup itself can be taken on its own as it tasted really good. We have Paradise Dynasty's home-made la mien thrown in, which had a unique soft texture to it. The crispy pan fried chicken chop was a nice side dish to have with the noodles. The subsequent noodle dishes came in the form of the La Mian with Vegetable Pork Wanton in Signature Pork Bone Soup and the La Mian with Minced Meat and Mushroom Sauce. I found Paradise Dynasty's noodle dishes were really delicious, coupled with their wantons. It was no wonder that I noticed most of the diners there ordered the La Mian. If you fancy some nice Shanghai Dim Sums, then by all means do order their Pork Dumpling with Hot Chilli Sauce. It was a spicy dish, which had this hot chilli sauce included inside. The pork dumpling was good though, as it felt velvety smooth when popped into the mouth. Beware of the spiciness though. We had some pastries for dessert, the first which was the Radish Pastry. It had a certain "popiah" flavour to it, but in a more refined tastier way. As for the Soufflé Egg White Balls stuffed with Red Bean and Banana, I felt they made it really soft and fluffy with lots of banana flavour to it. The whole this was actually made with egg white, to my surprise. Good stuff here. We ended a good afternoon lunch at Paradise Dynasty Paradigm Mall with their cold desserts. One of it was the Chilled Almond Pudding which had this distinct almond flavour to it with a piece of cherry and lychee on top. Overall it was a good meal out, so if you do have the chance to visit Paradigm Mall, don't forget to drop by this Chinese Restaurant. Oh! That mall that has been getting a lot of poor reviews and bad press lately. I would have loved the pork belly had it not been so over-priced. Never mind...will go elsewhere, places that I can afford. @henry, you ah.....oh boy, I am so drooling on those siu loong pauu!!!!.........argh! the waitresses dress like this? one of my friend commented xiao long bao so so only. Out 8 flavors only two are nice.. the rest so so nia..